Having become more accustomed to the brilliant light of New Mexico after living there for nine years, the light of Vilhelm Hammershøi’s paintings seemed muted at first to me. And yet he has been called the Danish painter of light, even poet of light. As one studies his works more closely, the light seems to dazzle in the midst of the often grey tones of his palette. I remember finally seeing Whilstler’s painting Mother in person and being stunned at the beauty of that muted painting. Hammershøi’s paintings of interiors remind me of that work. His lighting is subtle and quiet, bringing to mind the light reflected from a pearl, silently tucked up in an oyster shell with a rustic exterior, not very comely. Yet, upon opening, you discover a beauty of great price, round and white, with a white that glows with soft hints of the full spectrum of colours. 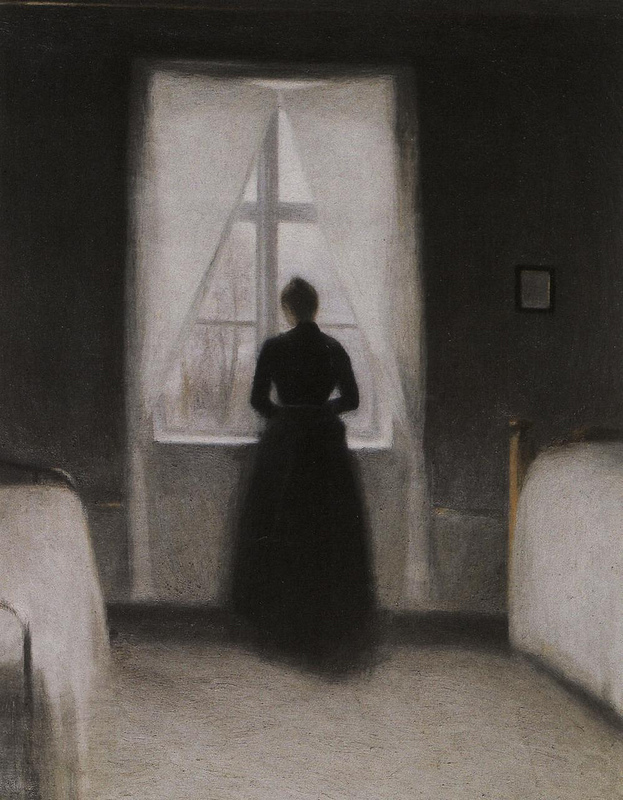 In Hammershøi's Bedroom this white is made even more textured by the greys surrounding the lighted areas and the black silhouette of the woman. I did not even know of Vilhelm Hammershøi until this past January, when I saw that ArtWay had used Bedroom in combination with three other compelling paintings of women at windows as part of a header on their website. I am drawn to paintings of windows. I was particularly drawn to the Hammershoi, less colourful than the others and yet almost more promising in terms of light. It is strangely hopeful. Questions linger in that room. The viewer wonders why the woman is there by herself and what she's looking at, if anything physical at all. Does she see the stand of bare tree trunks beyond her? In fact, the leftmost trunk provides one of the only hints of pure colour: an ochre, an echo of the colour of the the right bed frame. These are small touches of real warmth. Is the woman waiting for something or someone, invisible hands clasped in front of her? If she is, waiting itself is the question or many questions infused into the one act of standing there: the whats, the wheres, the whys and hows, and maybe, given our relational nature as human beings, most essentially the whos. Like the light in this painting, the questions seem muted, but no less profound. What is on the wall above the right bed? At first I imagined a framed proverb or poem, but more likely it's a small, misty mirror: a reminder that while she looks out beyond, we are looking in, asking questions of ourselves. We see ourselves ‘darkly’ in some small way in the mirror, as we do in the whole painting. We also see, as the woman does not, a large, pearly white triangle of light framing her, by sill and thin drapery. And a high cross is pointing above her, formed by the window frames. I don't know what Hammershøi's beliefs about God were, but as a Christian that three-sided form and tall cross leap out at me and infuse the room with faith, hope and some sense of love, despite the silence and solitude. She sees before her and in her mind's eye a scene we cannot know. We see a view of reality she cannot glimpse from her vantage point. That view makes suffering a given but ultimate hope a mysteriously shining reality. Vilhelm Hammershoi: Bedroom, 1890, oil on canvas, 73 x 58 cm. Private collection. Vilhelm Hammershoi was born in Copenhagen, Denmark in 1864. He lived in the old quarter, where he did much of his painting, although he traveled throughout Europe. His wife, Ida, was often the solitary subject in his paintings. He died in 1916 at age 52. Libbie Weber is an Anglican priest at The Fellowship of St. Barnabas, Albuquerque, New Mexico, USA, and often likes to use artworks as the basis for sermons and retreats. She is also a part-time librarian and is working toward her certificate in Formative Spirituality at the Epiphany Academy, Pittsburgh, PA, USA, founded by the Dutch Catholic priest and theologian Adrian van Kaam.